Details: WAFCOL Adult For all adult dogs Chicken & Corn - Hypoallergenic - Healthy Teeth & Gums - Digestion Care - Immune System Health Wafcol Adult is an outstanding, hypoallergenic food, which has been carefully formulated to meet all the nutritional requirements of the normally active adult dog. 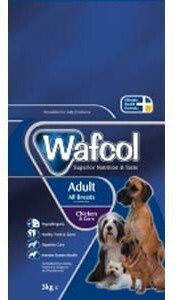 Enriched with the Wafcol Ultimate Health Formula, Wafcol Adult provides all that your dog needs for health & vitality. Wafcol Chicken & Corn is enriched with Bio-MosR, a mannan-oligosaccharide, that helps strengthen the dog's immune system and improve nutrient uptake, reducing the risk of digestive upsets and giving your dog the correct balance of vitamins and minerals for a healthy active life. Containing a balance of Omega 3 & 6 fatty acids and ensures that your dog has healthy skin and a glossy coat. Wafcol Adult is a hypoallergenic, Chicken & Corn food that is free from wheat gluten, barley, rye, oats, red meat, dairy products and all artificial colours and flavours. The symptoms of food allergies may vary, from diarrhoea to skin inflammation, where allergies occur a food must be offered that excludes the allergen. Wafcol Chicken & Corn has an appetising chicken taste which is highly palatable, easy on the digestion and is extremely useful for the treatment of many forms of colitis, as well as for dogs who suffer loose digestion.